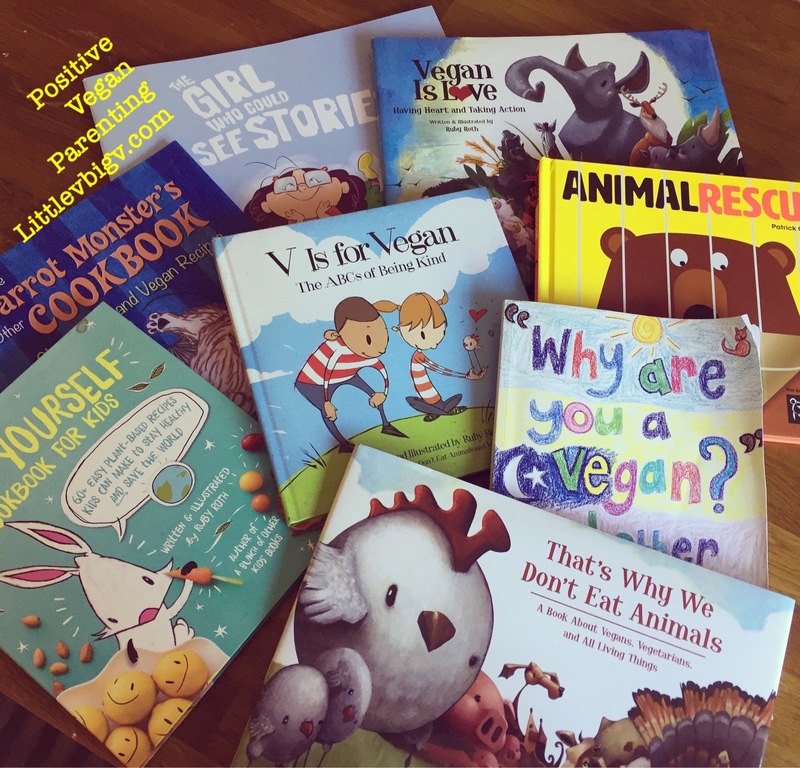 I often see posts on social media asking for book recommendations suitable for little vegans that take a gentle age-appropriate approach regarding veganism, animal rights and kindness towards all beings and the planet. 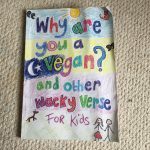 Below is a selection of my six-year-old’s favourite vegan-related books – I hope you have as much joy reading these with your kids as I do with Ruby. 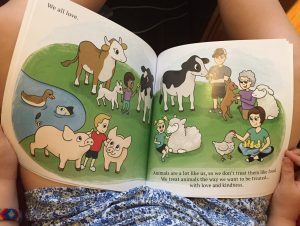 These books aren’t exclusively for vegan children of course, the messages of peace, respect, responsibility and kindness make beautiful gifts and reading for any child. 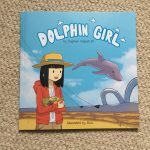 UPDATE – NEW BOOKS ADDED AT THE END! 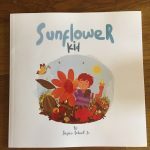 An incredibly gentle but striking picture book suitable for all ages especially very young children. It shows animals before and after liberation, or how some humans sadly use them and where they should be. 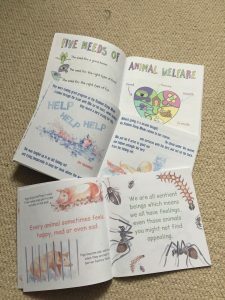 Cleverly designed with interactive transparent pages, your little ones can take part in freeing the animals back to where they belong. 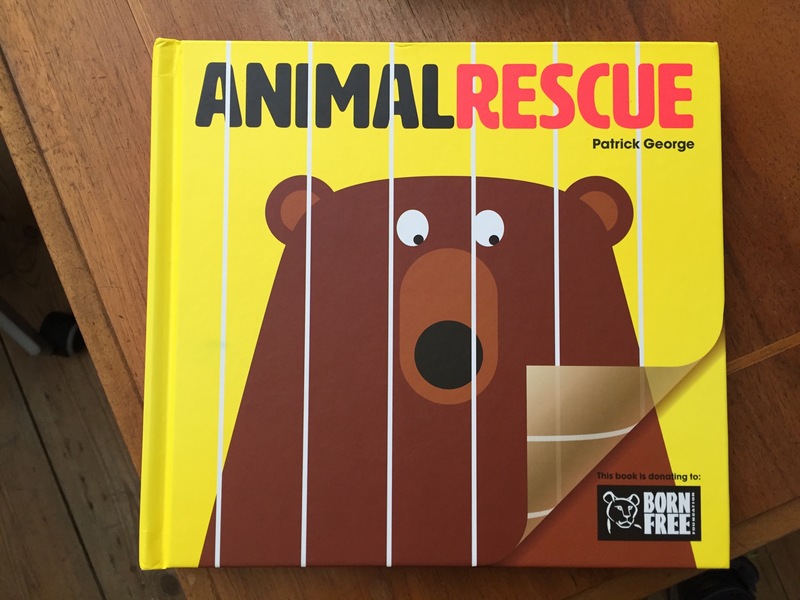 This is one of our favourite books and it really helps children (and adults) see animals as individuals in their natural habitat and why we should not be using them as objects for our personal gain. 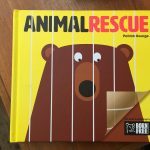 There is also a fun app to go with the book – just search Animal Rescue in your app store. 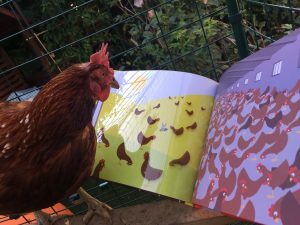 You can see Razzle our rescue hen loves this book too! 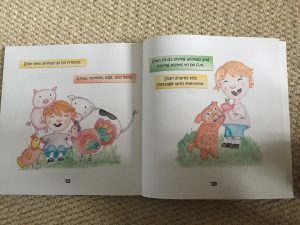 One of three books we have by Ruby Roth, this is again suitable for really young children. 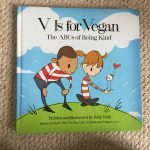 A fun and smart way to learn the alphabet as well as understand how positive, kind and fun taking better care of our planet, our animal friends and our bodies is. 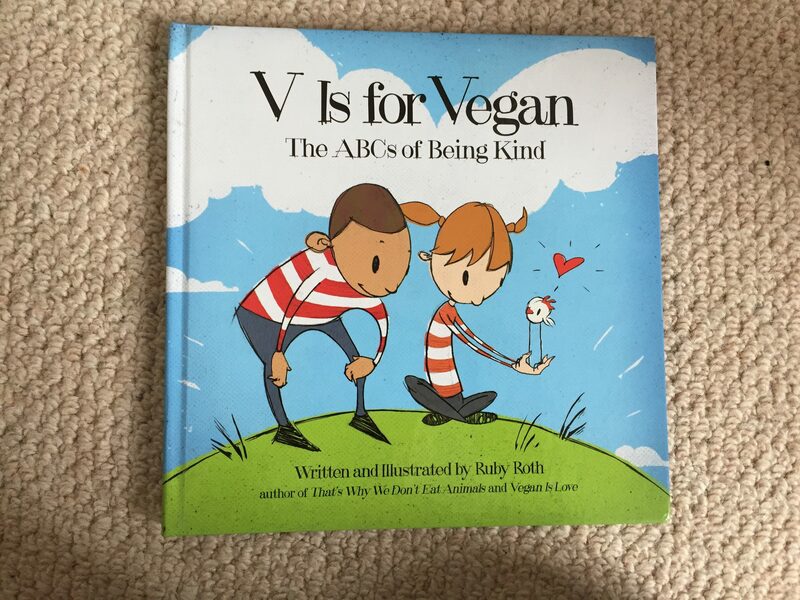 “A is for animals – friends, not food. We don’t eat our friends, they’d find it quite rude”. 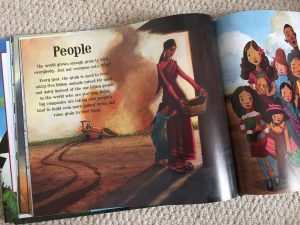 This is a perfect present to teach kindness and respect from day one. 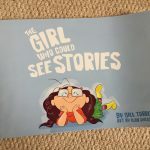 Follow the adventures of Sofiel who has an amazing gift of seeing stories in every object she sees. 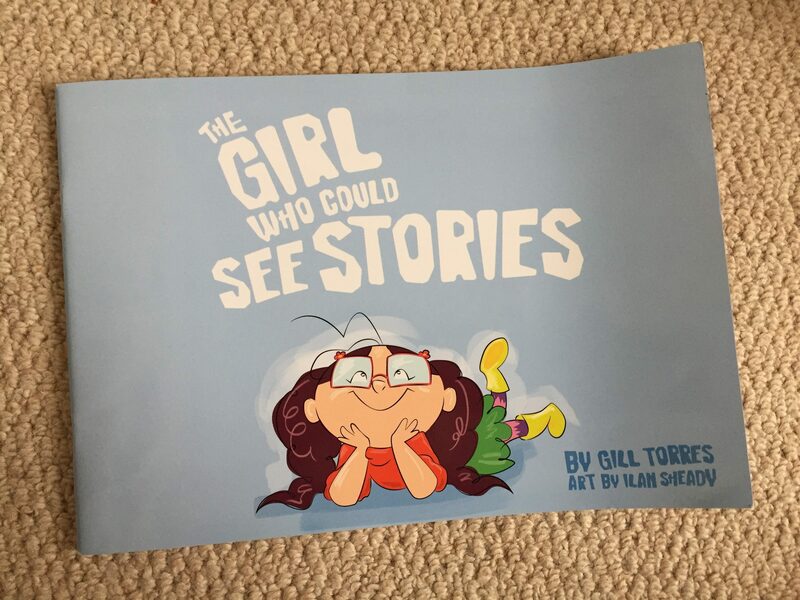 She can see how a beautiful butterfly started out as a tiny caterpillar – the exciting adventures a bicycle has been on before being left propped up against the wall, and she can even see all the stories from passengers in the back of taxis that drive past. 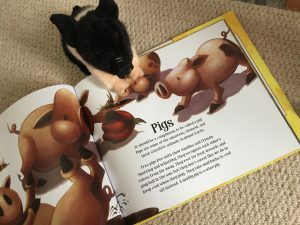 But what happens when she starts to see the stories her food has taken to get to her plate – the animals’ lives before they were turned in to burgers – her favourite food. What can Sofiel do to stop eating such sadness and feel happy again? 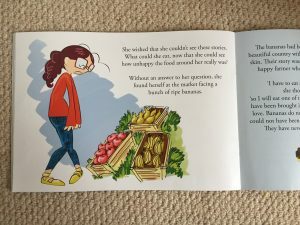 How can she find better and kinder food to help her grow and spread the message to help other people make kinder choices? 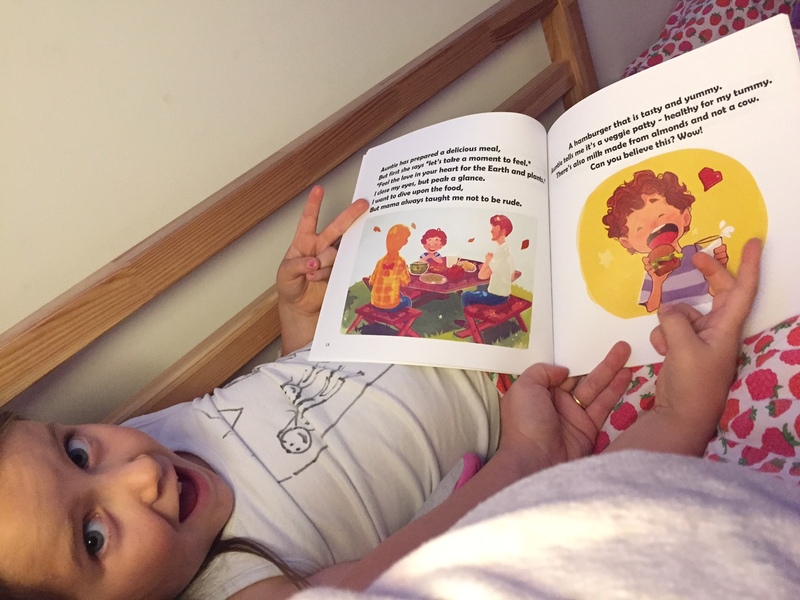 A fabulous book written by a mother and daughter team. Packed with funny cartoons that show how you can cope with questions about being vegan. 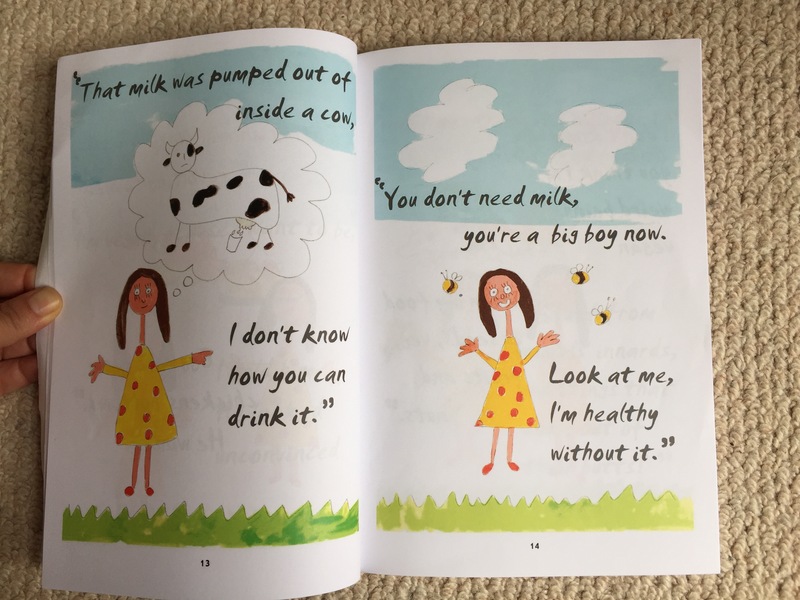 There are also rhyming stories, offbeat verses and vegan-themed nursery songs, as well as the true story of Deidra the dairy cow that brilliantly explains to kids why we should not be separating mum and baby cows for dairy products. 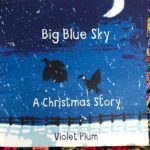 This story actually made my daughter and I cry the first time we read it as it is so beautiful – you have been warned! 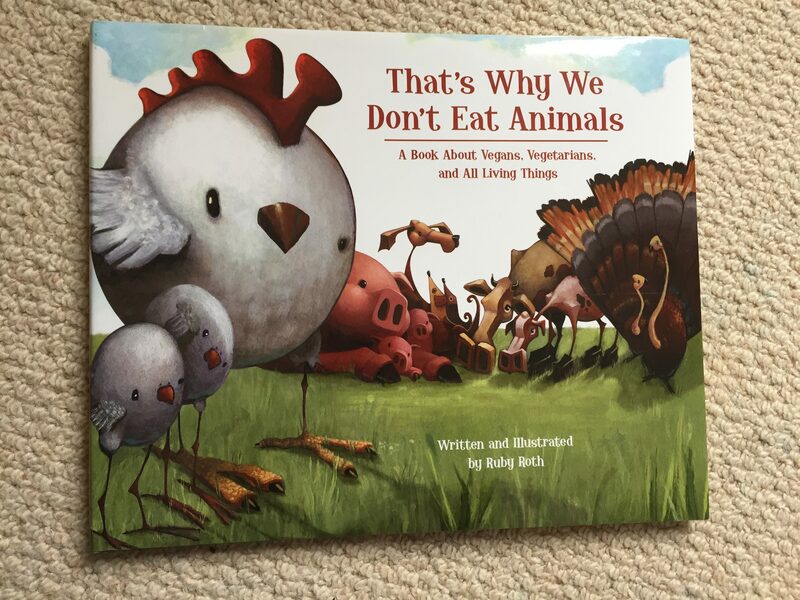 Another beloved classic by Ruby Ruth – this time focusing on the natural behaviours of farmed animals and how they are designed to live and enjoy life if given the freedom to do so. With cool facts and drawings on pigs, cows, fish, quail, turkeys and many more, your kids won’t be seeing these wonderful creatures as food anymore. 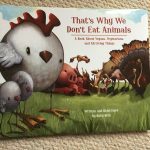 With a thought-provoking intro too, this book sends a very powerful message about why vegans don’t eat animals. This new book is one of our firm favourites already. It is such a delightful read that helps to broaden minds beyond just what we eat. 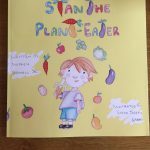 Follow a young boy’s fun adventures when he visits his Auntie and Uncle’s eco home – “Mom says they’re different then she and me. I can’t wait to see my uncle and auntie”. The rhythmic story embraces living in tune with nature – from solar power to yoga, growing food and even using a composting toilet! 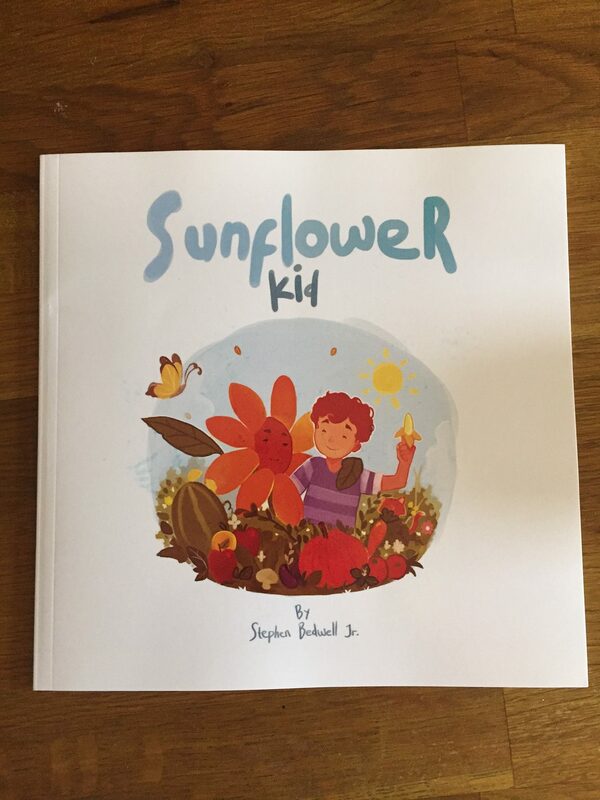 The second rhyming book by Stephen. 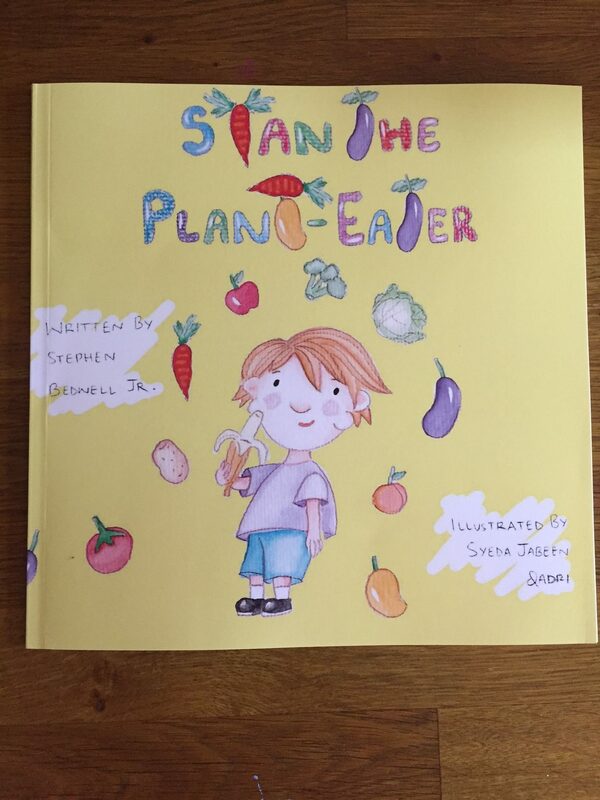 Stan loves animals and eating plants and he has a very simple and gentle way to share with you why he eats what he eats. He knows what foods will help him grow up strong, healthy and kind. He looks after his animal friends as well as his health in this very sweet book. 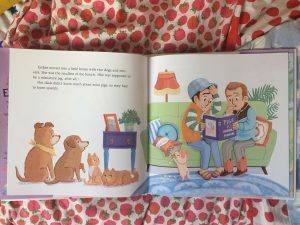 This is a wonderful pre-school story. 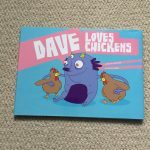 Bright and fun pre-school rhyming book about Dave, a super-cool alien who just can’t understand why anyone on Earth would eat a chicken! 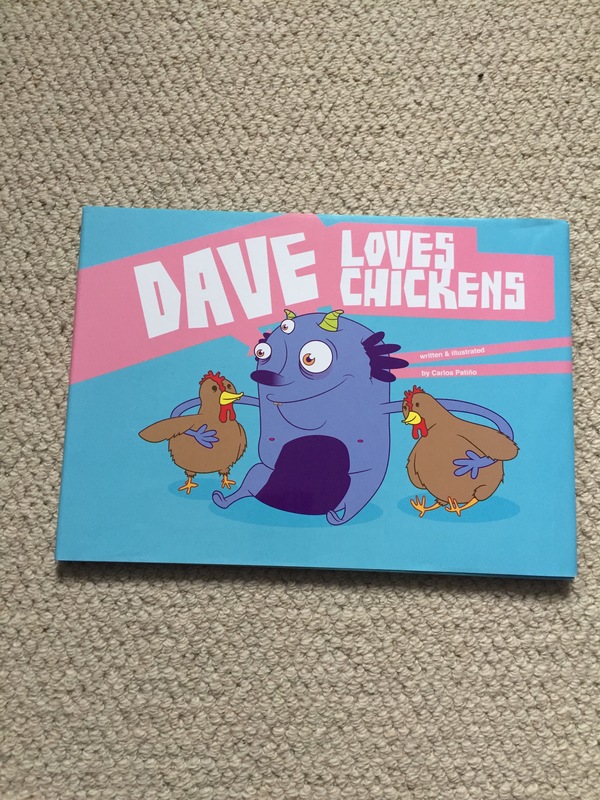 Dave is right – chickens really are amazing animals and this book will tell you why, sharing lots of interesting facts about our feathered friends. Our rescue hens most definitely approve of this book! 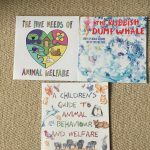 Nicola’s A Children’s Guide to Animal Behaviour and Welfare invites children to discover a range of species to learn about the needs of animals. 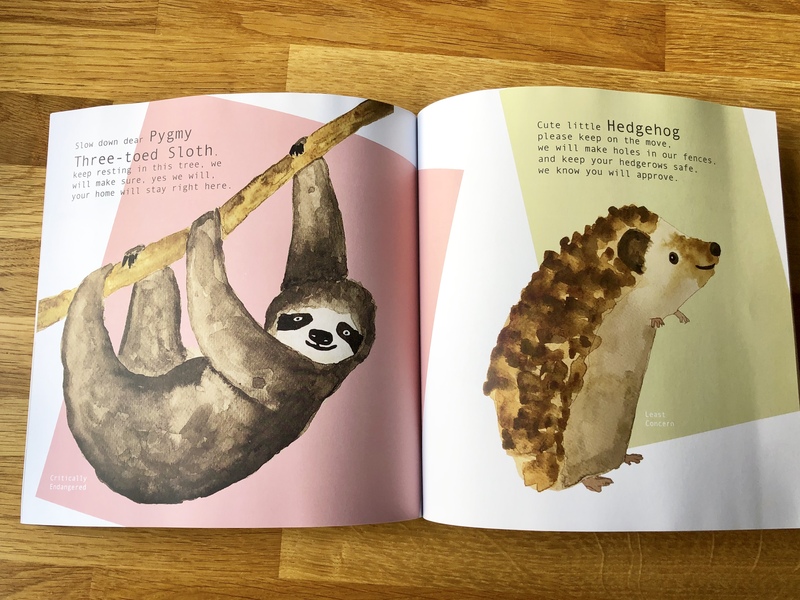 From sea creatures to gorillas, the first half of the book examines animal behaviour, and the most suitable natural habitats, food and social requirements for them. Although we are all unique, the one thing we all have in common is the right to freedom and that we all feel – animals are sentient beings. 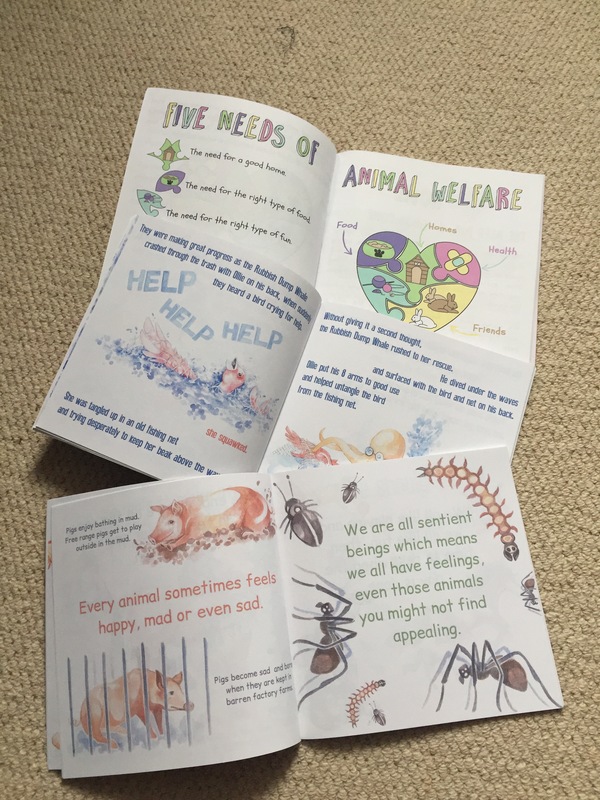 The second half focuses on rabbits, hamsters and cats to apply the different requirements we learned in the first half to these three species. 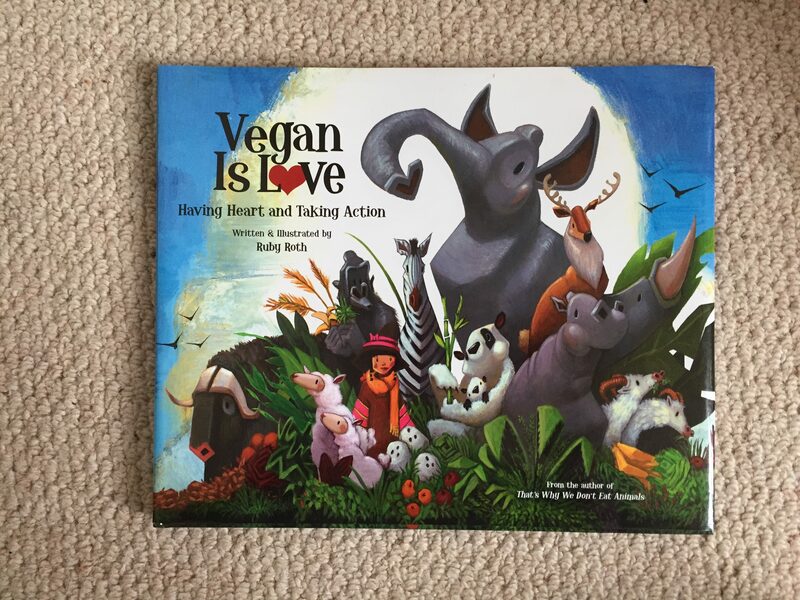 This would make a brilliant gift for any child, especially those who would like to work with animals. An interesting read. 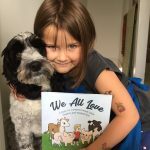 The Five Needs of Animal Welfare is similar to the first book, but focuses more on what we as care-givers need to know to ensure our animal companions are happy in our homes. 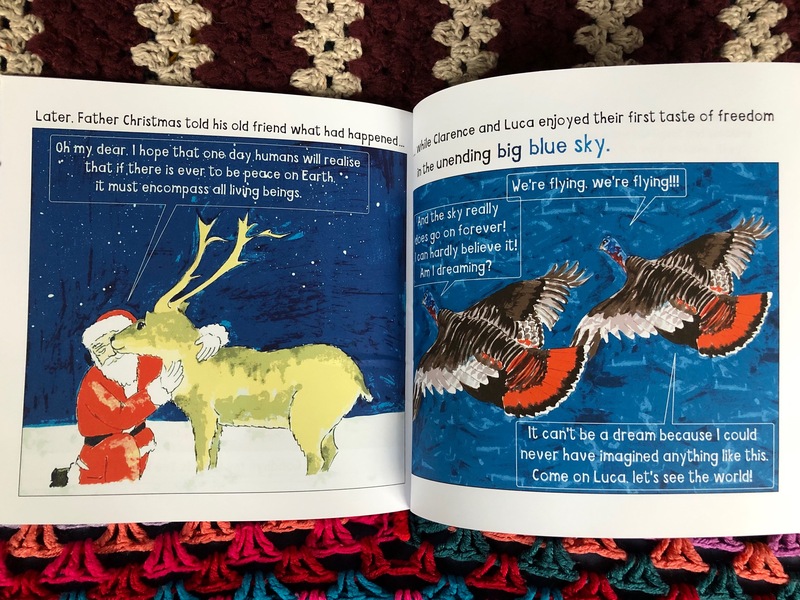 If you know any children whose family is about to adopt an animal or already live with one, this is the perfect gift. Cute drawings and even a colouring-in page at the back. 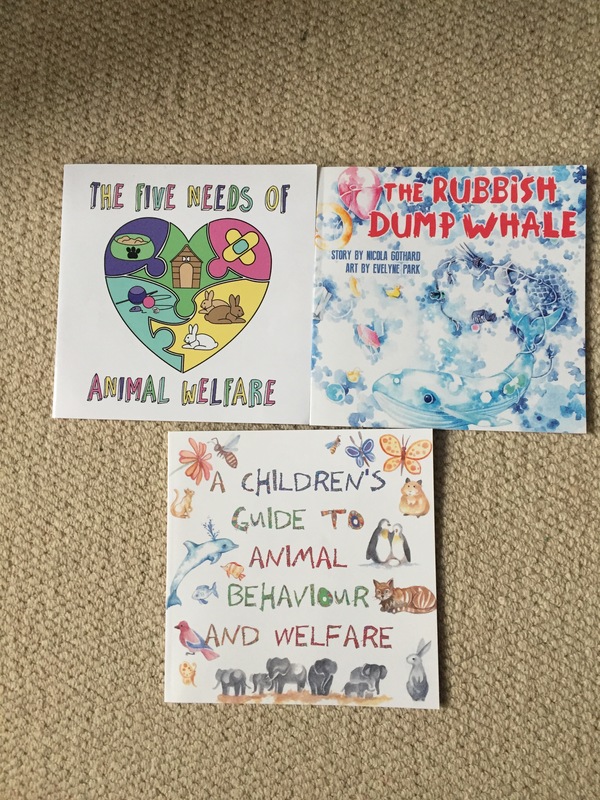 Unlike the two books above, The Rubbish Dump Whale is fiction, although the reality for our ocean friends struggling to cope with humankind’s plastic pollution is very real. Follow the touching story of the Rubbish Dump Whale and his friends as they save their pals from getting tangled in rubbish and together make their way to the shore to leave a very important message for us land-based animals. For children aged 4 and up. 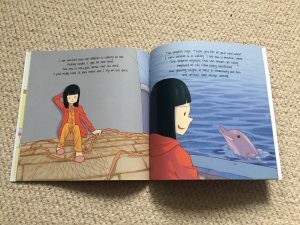 A book with a heart of gold, again addressing the ocean and the plagues of overfishing and pollution, and how we must all make changes to take care of the sea and the animals that live above and beneath its waves. 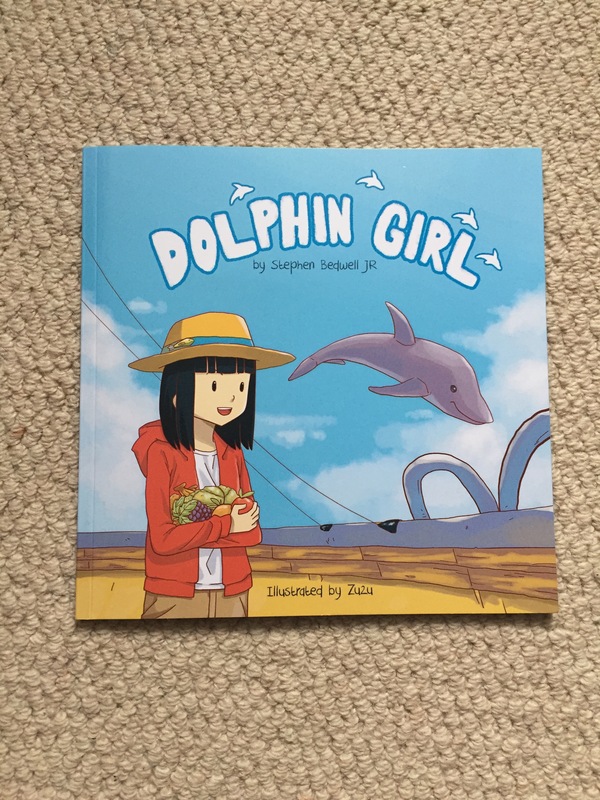 Dolphin Girl takes us on an eye-opening adventure on the heroine’s grandparents’ boat, where she meets a very special friend and shares what she learns. 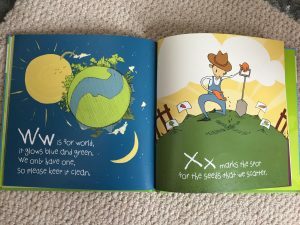 Although I found the rhyming a little unnatural to read and the punctuation is confusing, it is a lovely book and my daughter enjoys it very much. For primary school children. 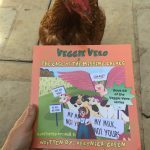 Brilliant fun, this book is about delivering the vegan message through education, kindness and team work. 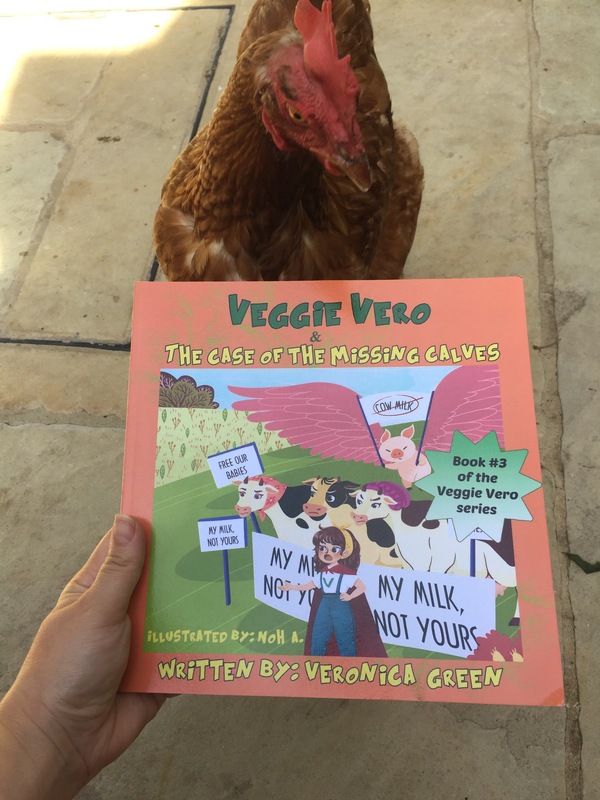 Follow Vero’s adventures with her friends as they help the mum cows reunite with their babies and introduce delicious plant milks to the people of Kalesville. 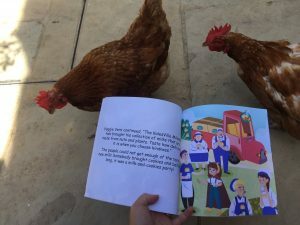 There are more books in this series that I hope to read to my little one (and the chickens who seemed very interested!) as this was as nice for me to read as it was for Ruby. There are colouring-in pages at the back too. 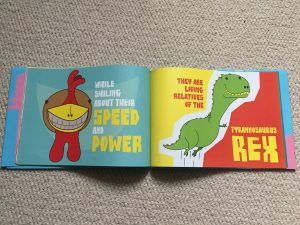 A great book for ages 3 and up. 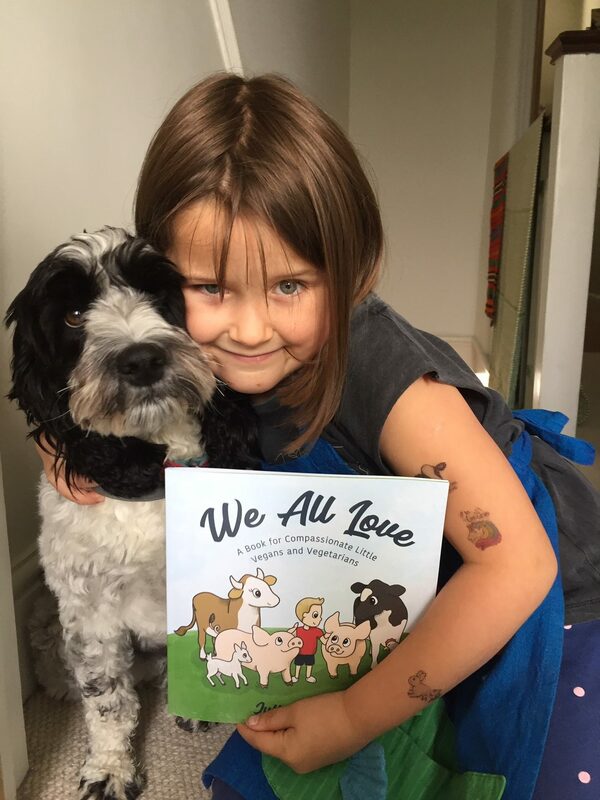 An utterly charming book for babies and very young children – in the simplest and most kind way it gently teaches little hearts that animals are just like us. We love, we play and we feel. Adorable book for under-4s. 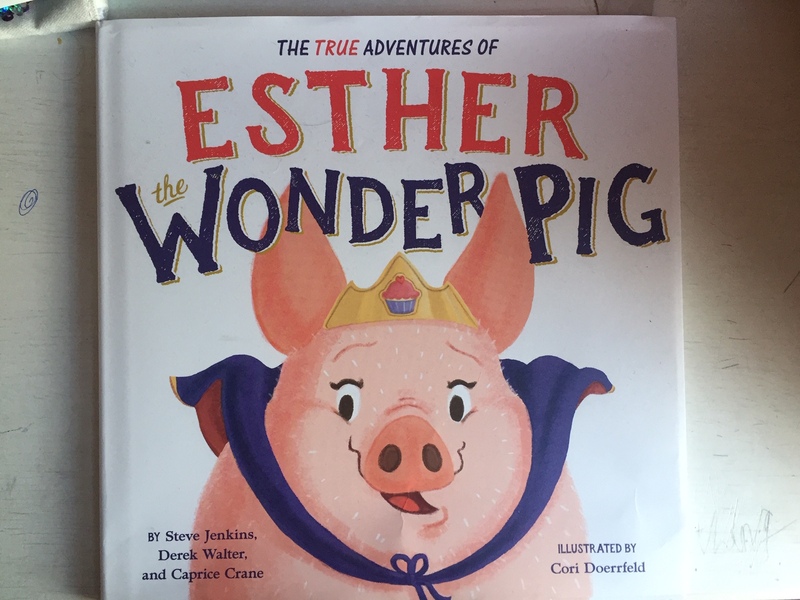 At last, Esther’s story has been made into a children’s book – the grown-up version of this true story has had me in tears, stitches and falling in love with this humongous “mini” piggy. 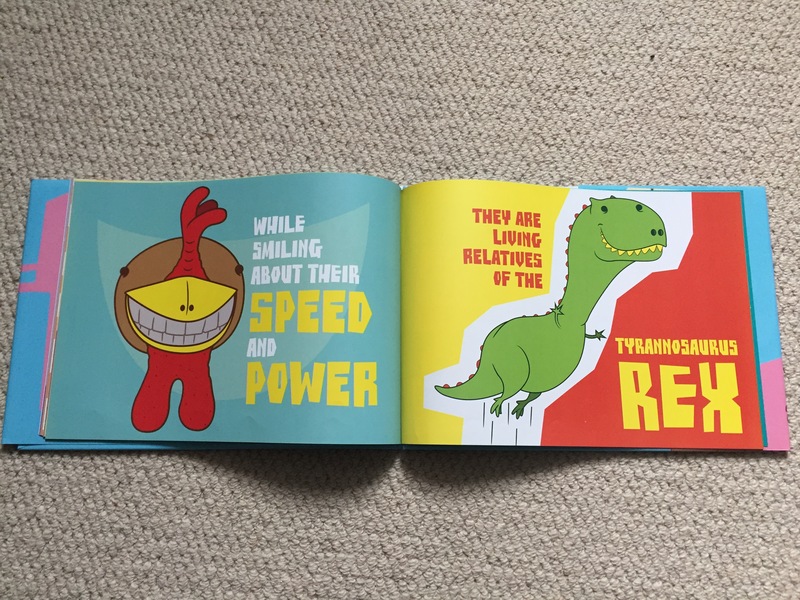 My daughter just dived into this book and giggled her way from start to finish. 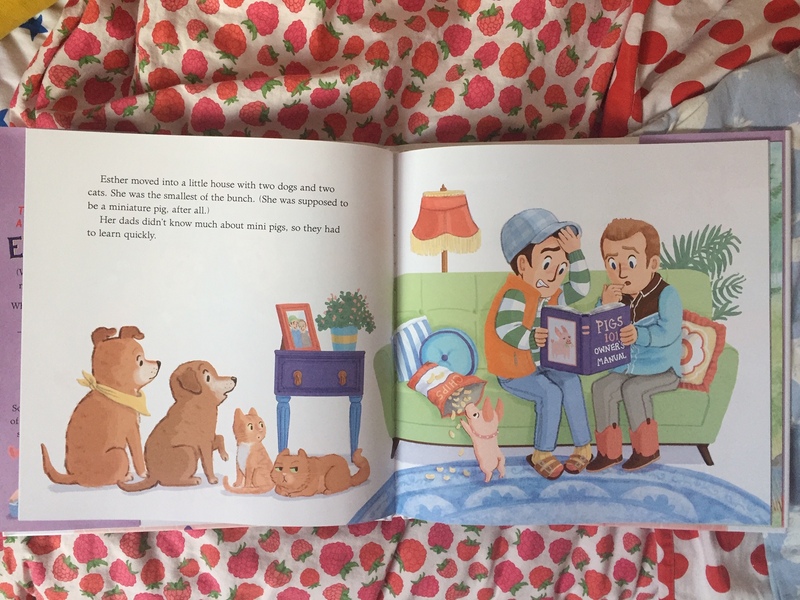 A book for all animal-respecting children. 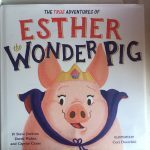 You can follow Esther’s adventures on Inst, and Facebook too. She’s one lucky pig! 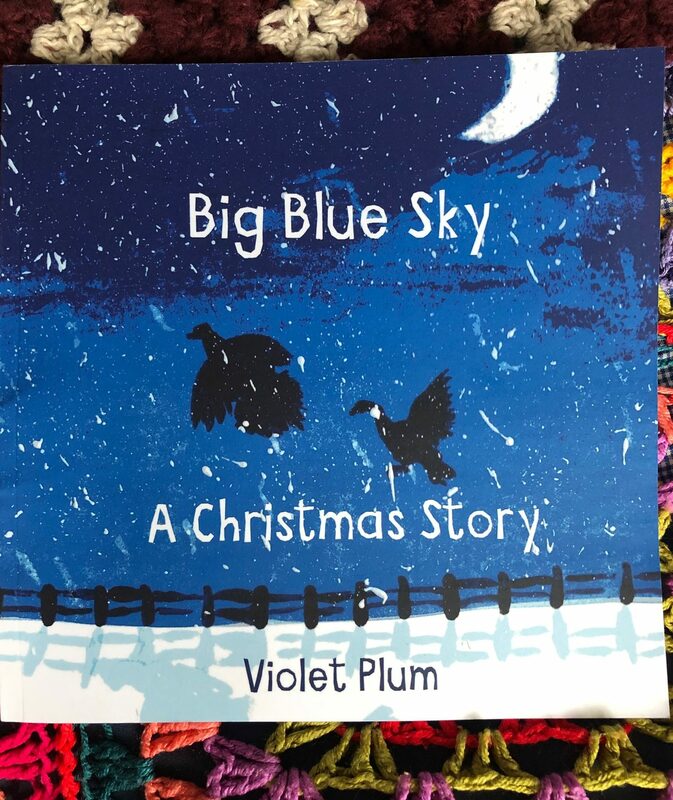 A beautiful Christmas story about two turkey friends who dream of seeing the big blue sky beyond the factory where they live, being fattened up for Christmas Day. Does this sky really exist? Can they ever escape? Follow their heartwarming story of friendship, hope and freedom. 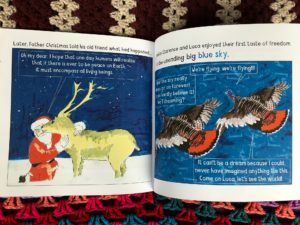 A very gentle book, suitable for all children and the perfect Christmas gift. 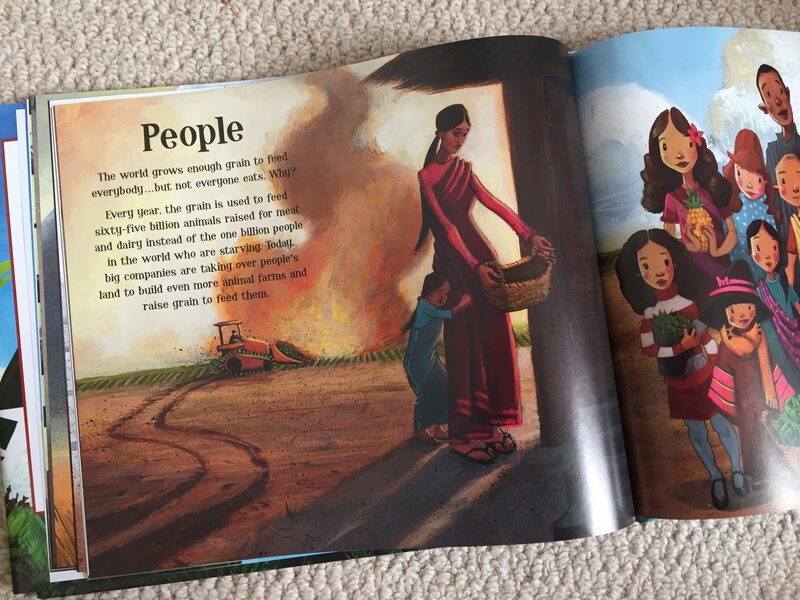 A book painfully necessary for all children. 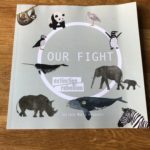 A very serious issue illustrated and written so beautifully and sensitively, helping very young children understand that we must act now to save our home, our families and our animal friends. For the many parents wondering how to gently approach the subject of climate change with little ones without scaring them, this book is a great starting point. 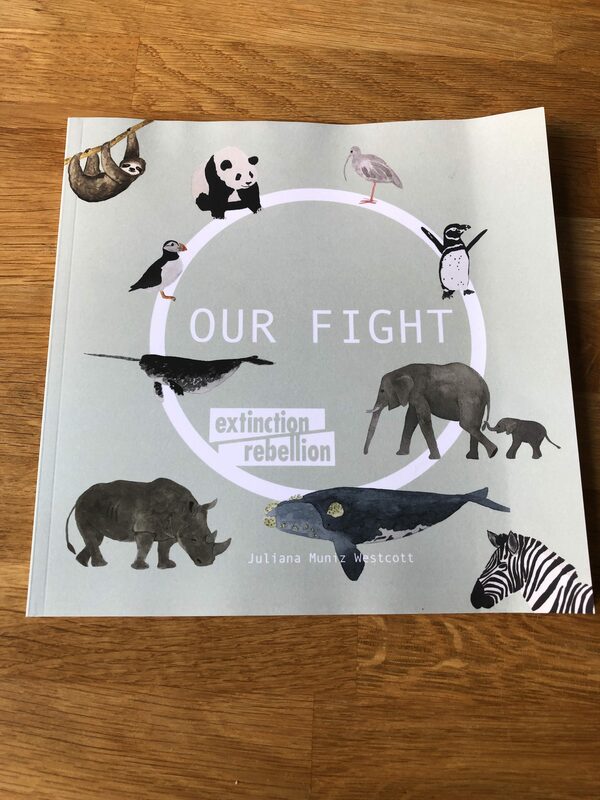 Proceeds for the book go to Extinction Rebellion – see their website for further information and to get involved in climate action. There are some great family friendly events being organised around the world. Book available from Amazon. 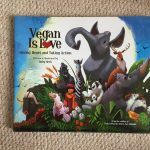 If I’ve missed any great vegan books for kids, please drop me a message so we can grab a copy and let you know what we think. I will keep adding to this post as and when we read new ones… so see you back here soon! This is a great list! 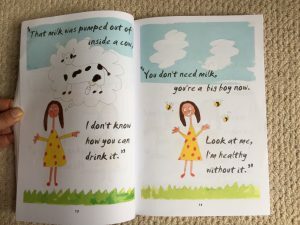 You can check out my new vegan children’s book, That’s Not My Momma’s Milk! 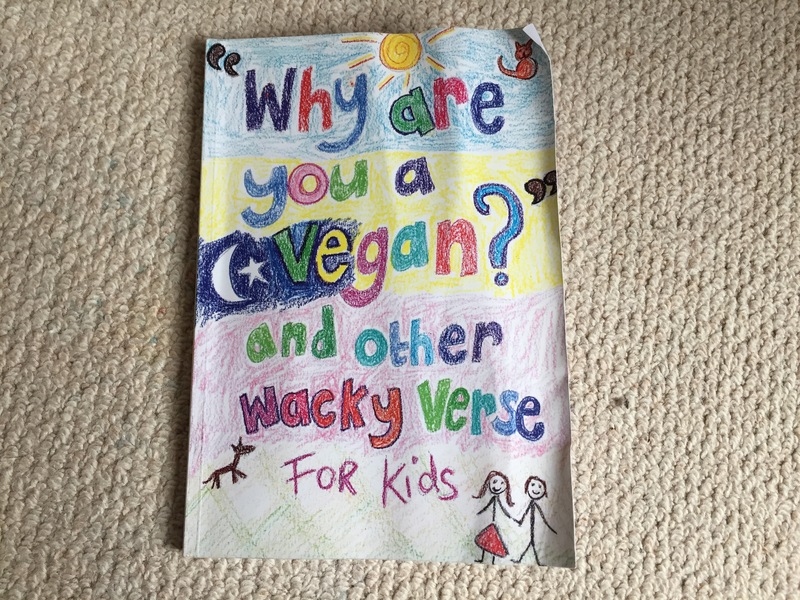 It is available on Amazon and at Vegan Publishers.